What can we say? This is one of the greats! 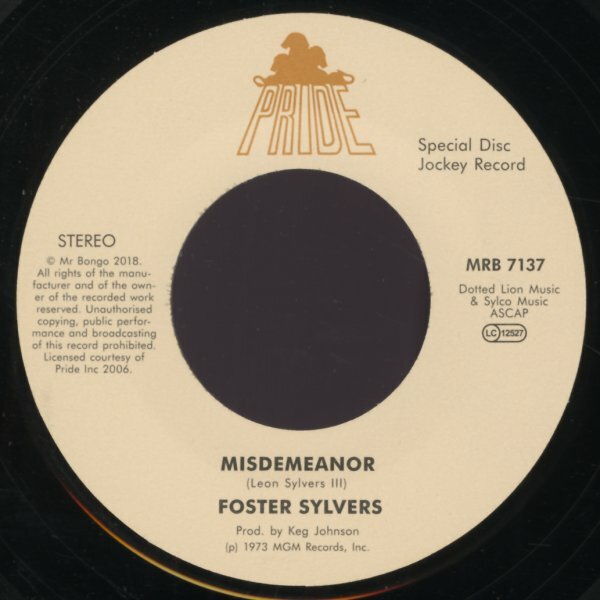 Foster Sylvers' "Misdemeanor" is one of the greatest-ever funky tunes from the 70s – made famous years back by a DOC sample, but loved way before that by anyone with a funky set of ears! The cut's got this incredibly strange groove – bass sneaking out a rhythm before the drums, both of them still close enough to make things very very funky – and Foster singing over the top in sweet falsetto soul! "When I'm Near You" is a bit sweeter, but has this fantastic snare part that's really wonderful – and a nicely jazzy touch of guitar! © 1996-2019, Dusty Groove, Inc.